Review: As Sherry Holmes Baldwin (age 13) tries to balance the 7th grade, her boyfriend Josh, her best friend Junie, and a new step-mom, things start to get out of control. Since her mom had recently died, Sherry’s new mother is her language arts teacher, Paula, (a.k.a. the Ruler). But Sherry’s ghost mother gets enrolled into the Ghost Academy, and starts to compete in the Ghostlympics. The Ghostlympics are special events hosted by the Ghost Academy, such as lifting objects and animal control, for ghosts. The grand- prize is 5 minutes of Real Time, where a ghost can interact with a family member for 5 minutes, but the mortal will not remember any of it afterwards. Suddenly, weird things start to happen to the Ruler. Her keys show up in odd places, and her tires get slashed in mid-day with one of her own knives which were in the kitchen. Then, in the Robotics Practice Competition, the Donner Dynamo’s robot seems to be better than usual, in fact too good than it could have been before. The Ghost Academy asks for Sherry’s help on finding the Ruler’s stalker, which turns out to be a ghost as well. Will Sherry be able to stop him/her before he/she hurts one of Sherry’s loved ones? Find out in I So Don’t Do Spooky, by Barrie Summy. I found this book to be fantastic! It put together the fantasy of ghosts along with the realistic life of a teenage girl to create an awesome clash of literature. Honestly, this book deserves a 5/5 star rating. It kept me on edge every chapter and kept me begging for more. I felt part of the story, as if I were at a movie and watching the scenes full screen in my head. Also, I was more interested in the story because ghosts are a topic I find to be eccentric and unexplainable. I was proud to own this book, because it is a story worth reading over and over and over again. I hope you feel the same way too. I’d like to give thanks to the author for creating an amazing book that continues to awe me to this day. I So Don’t Do Spooky is possibly one of the best books I have ever read. We would like to thank Random House for providing a copy of I So Don't Do Spooky for this review. 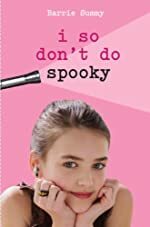 Have you read I So Don't Do Spooky? How would you rate it? Lynnea, thank you for this enthusiastic review! And five stars?! Wow! I'm so glad you enjoyed I So Don't Do Spooky.